Even before the first scene in Kabir Khan’s “Phantom”, there is a long, hastily narrated disclaimer using all sorts of legalese about how the film does not allude to any person, dead or alive. But once the movie gets underway, you realise that the disclaimer was just that – legalese. The story itself may be fiction, and the good guys may not really exist, but we all know who the bad guys are in this caper – the Pakistan-based Lashkar-e-Taiba and its leader Hafiz Saeed, whose name is thinly disguised as Hariz Saeed in the film. Borrowing heavily from films like Steven Spielberg’s “Munich” and even Nikhil Advani’s recent “D-Day”, Khan uses the 2008 Mumbai attacks as a background to construct a story of one man’s mission to eliminate all those behind the three-day rampage that killed 166 people. Saif Ali Khan plays Daniyal Khan, a disgraced army officer who is brought back to eliminate the leadership of the group behind the 26/11 attacks. He enlists the help of former Indian intelligence agent Nawaz Mistry (Katrina Kaif), who is at first reluctant but changes her mind after a rather bizarre confession about how she used to drink tea and eat chocolate pastries at the Taj Mahal hotel, one of the targets of the Mumbai attacks. The fact that she is reminiscing about the loss of her tea party venue when so many people lost their lives seems to have escaped the director’s irony meter. It is because of moments like these, when “Phantom” lapses into emotion, that the film falters. The action sequences, while not out of the ordinary, are fast-paced and competent enough for the viewer to remain engaged. But Khan and co-writer Parveez Shaikh fail to come up with any unexpected twists and turns. Despite their attempts to create suspense, they end up depicting chaos on the screen. Daniyal flits from one country to the next, orchestrating murders, faking deaths and even fighting rebel forces in Syria. While it would be too much to expect a mainstream Hindi film to take into account geo-political realities in its plotline, it should be fair to expect some amount of realism. Sample this: After Daniyal’s plan has been revealed, a senior official of Pakistan’s spy agency ISI tells his minion, “Mujhe har file ke printout chahiye” (I want a printout of every file), and the next few minutes are spent taking printouts upon printouts. This is evidence of what is obviously not a well thought out screenplay. Carbon footprint apart, it might have been easier to just go through the files on a computer. What also doesn’t help the film’s cause is that the lead pair doesn’t impress in the acting department. Even in what is supposed to be a high-octane fight sequence in war-torn Syria, Saif Ali Khan and Katrina Kaif are so underwhelming that it’s difficult for the audience to drum up any enthusiasm for their mission. 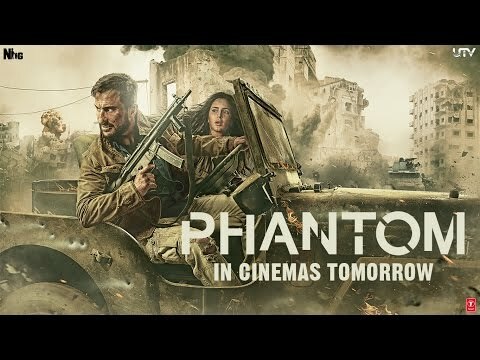 “Phantom” is a run-of-the-mill action thriller that fails to take its rather clever idea and make it rise higher. Instead, like a Phantom, it disappears into thin air.